All of the lower-priced areas circled in red also just happen to be markets where Google Fiber already exists or is planning to build out in the near future. Remember how AT&T made its grand case for the DirecTV merger? All that revenue from the 20-plus million DirecTV subscribers would help AT&T build out a high-speed broadband network that competes with the local cable monopolies. And so far that’s been true with the continued expansion of AT&T’s GigaPower service… except when those established cable monopolies don’t match GigaPower’s top speeds, customers are still paying top dollar. It’s a topic we’ve covered before, but the hope is that the more consumers are aware of these price discrepancies, the more they’ll demand that AT&T change its policies. For those who aren’t familiar with AT&T’s odd pricing model for GigaPower, here’s how it’s worked thus far. If you live in a new GigaPower market and your only other choice for broadband is cable Internet (with speeds that top out anywhere from 25 megabits per second to 100Mbps), AT&T will charge $110/month. 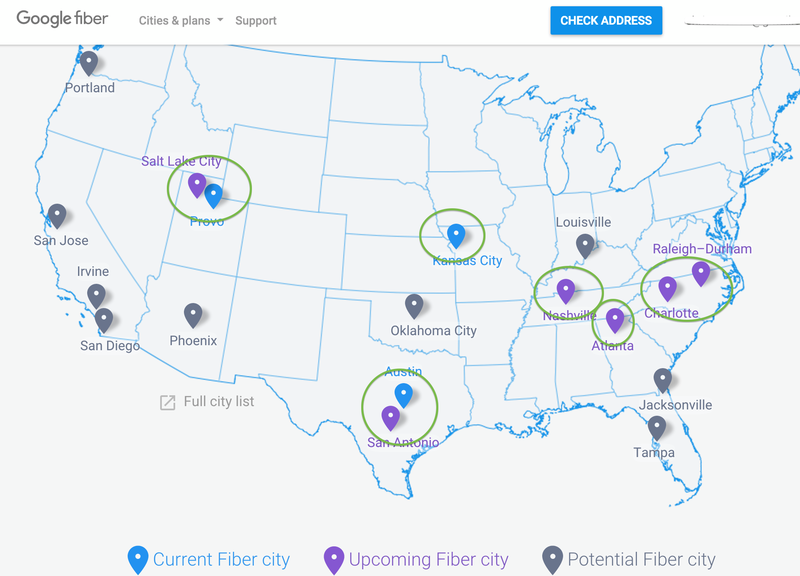 If you live in an area where Google Fiber (which offers 1 gigabit per second service for $70/month), AT&T will charge you significantly less, sometimes matching that Google price, sometimes slightly higher like the $80/month offered in Atlanta… which happens to be where Comcast is launching its fiber service that’s twice as fast as Google or AT&T. The only one missing is Salt Lake City/Provo in Utah, and that’s only because AT&T isn’t the primary landline service provider in those cities. This morning, AT&T announced a new slate of markets for GigaPower, and just as expected, these price discrepancies are still present. In markets where Google and/or Comcast are in the process of building out fiber networks, AT&T is still charging a lot less. 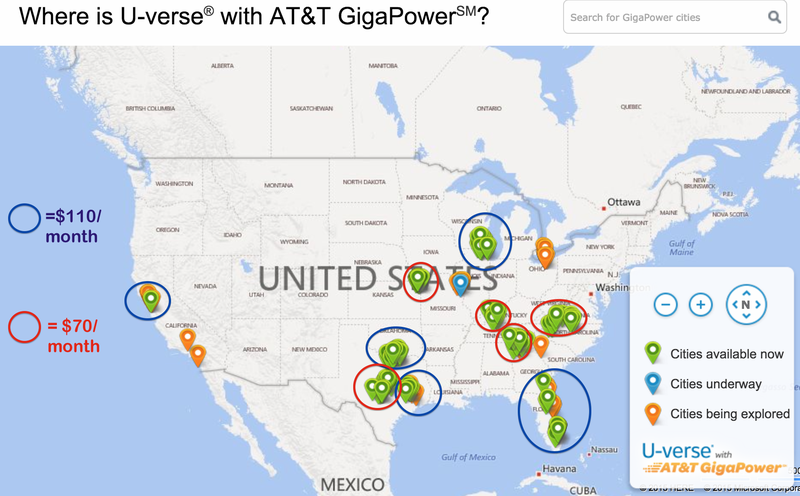 This means that new GigaPower markets in Georgia (Alpharetta, Cartersville, Duluth, East Point, Rome); North Carolina (Clemmons, Garner, Holly Springs, Salisbury — where the city just launched its own 10 gigabit service); and Tennessee (Galatin, Spring Hill) get the $70/month option. Gardens, Parkland); Illinois (Bolingbrook, Mundelein, Shorewood, Volo); or even AT&T’s home state of Texas (Houston), will be paying the full $110/month for the same service. Companies aren’t going to give consumers better prices unless they demand them by refusing to buy at the high asking price, or unless competitors offer a comparable service at a lower rate.